We use only HIGH QUALITY, DURABLE materials to make Mister Boardwalk® Products. 3/4" to 1 1/2" 3/4" to 1 1/4"
PT (Pressure Treated Southern Yellow Pine) is the MOST POPULAR deck lumber in the USA. REASONABLY PRICED, guaranteed against ROT & TERMITES, resistant to MOLD & MILDEW, with PROVEN LONGEVITY...even directly on the ground. 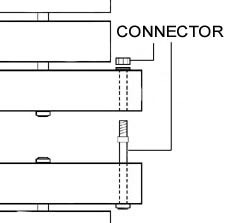 This is especially important for Mister Boardwalk® products, since most of our products lay on the ground. We buy only Southern Yellow Pine that has been Pressure Treated with ACQ--an arsenic free preservative. For in depth info, click on treated wood.com. First of all, PT is, by far, the least expensive wood that's guaranteed against ROT & TERMITES--if a PT product that we supply has rotted or become infested, we will replace it--no questions asked! We don't know of a single instance where rotting or infestation has occurred. PT is also a very strong wood. Mister Boardwalk® doormats take a real beating, especially in the snow belt where customers pry our mats out of the ice and bang them on the stoop to remove accumulated snow & ice. Still, after 15 plus years, we seldom see a broken PT doormat. One of the unsung features of PT is RESISTANCE to MOLD & MILDEW penetration. Surface mold & mildew can accumulate on almost anything, as it can on PT. But a bleach solution, pressure washer or even a "spray on, rinse off" deck cleaner will quickly clean PT to a like new appearance. Again, in 15 plus years we have never seen mold or mildew penetrate PT like it does so many other woods. Even Cypress & Cedar can become black over time with mold & mildew that has penetrated so far that it can't be removed. For this reason, PT is especially useful as an outdoor SHOWER MAT--no matter how "slimy" a PT SHOWER MAT becomes, it can always be cleaned with soap & water or a bleach solution. And here's a great tip for cleaning outside Shower Mats (and many other "hard to clean" things around the yard)--take them to the "wand" car wash & give them a good power wash. Of course, if you have a power washer you know how easily PT cleans up with pressure washing. When installed in a location that gets lots of sun, PT is well known to dry out and then crack, splinter and warp. The good news is that Mister Boardwalk® products typically lay directly on the ground so that the wood remains damp & supple, drawing moisture from the ground that minimizes cracking, splintering and warping. When installed in the shade, PT does beautifully! One of our Mister Boardwalk® employee's has had a PT deck for over 20 YEARS & a Mister Boardwalk® PT walkway for over 10 YEARS without a single splinter developing. The trick? The deck is on the north side of the house & the walkway is directly on the ground under several large trees--they are never exposed directly to the sun for long periods! We have yet to see cracking, splitting or warping when PT is protected from the sun. Because of this feature, our PT mats are very popular for enclosed outdoor showers. 1) obviously, try to keep PT out of direct sunlight. For example, bring in your roll out walkways during the off season at a summer home. 2) periodically inspect exposed PT surfaces for splintering (especially those exposed to the sun). If you see splintering, remove it with a razor knife. PT generally stabilizes over the first year or two, after which you should see minimal, if any, additional splintering or warping. 3) consider staining PT with a high quality deck stain. 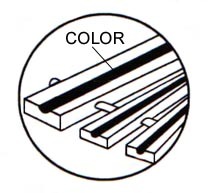 Most hardware stores and home centers offer a full selection of solid or semi-transparent colors from which to choose. The stain will offer some protection from the sun and help retard cracking, splitting or warping. Many consumers assume that PT is treated with a chemical preservative that includes arsenic. That used to be true, but is no longer the case. Mister Boardwalk® only uses PT treated with ACQ, a preservative that is arsenic free. Still, even ACQ is a chemical and you may prefer one of the alternatives that we offer--Cypress (100% Natural, Certified as responsibly harvested), TREX®*** (a Recycled product combining sawdust & recycled plastic shopping bags) or Teak/Ipe** (also 100% Natural & Certified as responsibly harvested). All of these alternatives are chemical free. Cypress, and Cedar too, enjoy a remarkable reputation for longevity. We recently saw a catalog advertisement for a "100 Year Doormat" made from Cypress. In the old days that was true, when "old growth" trees were still available. Today, though, when only "new growth" trees are available, that's stretching it--A LOT! Cypress and Cedar are wonderful woods, but the "new growth" trees simply don't measure up to the reputation. When put directly on the ground, as most of our products are, rotting will begin very quickly for the typical installation. We base that on our own experience and on feedback from a variety of consumers that have experienced problems--Cedar fence posts, for example that rot very quickly. If you think about it, how many new Cypress or Cedar fence posts have you seen recently? Hardly any--there are other materials now available that will last much longer. For these reasons, we don't guarantee Cypress, or Cedar when we supply it, against rotting or deterioration. We have also seen cracking, splitting and splintering as well as mold and mildew penetration. In short, we don't recommend Cypress or Cedar for outdoor, permanent or semi-permanent installations. We do suggest Cypress for indoor use and for uses that require a lightweight, portable product, such as a temporary walkway at the beach for someone that's wheelchair bound or for someone that has difficulty walking in the sand. That said, Cypress & Cedar are beautiful, natural woods with no chemical additives, and we only supply Cypress that has been certified as responsibly harvested. We currently offer only Cypress, believing that Cypress is generally a harder wood than Cedar. We expect Cypress to be a little more durable. Because Cypress orders are all made to order, delivery time is typically much longer than our other products, especially during our busy season from March through August. You might like to know that Cypress & Cedar got their great reputations back in the good old days when "old growth, heartwood" was still available in large quantities. Heartwood is the center of the tree & is very hard. In old growth trees the heartwood can be most of the tree, so there was plenty available. We read recently of an ancient wooden boat that was recovered from the bottom of a river--even after hundreds of years the old growth Cypress heartwood was still intact. Sorry, but we can't get that stuff for you anymore--wish we could! 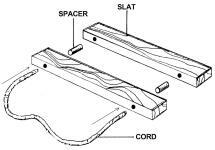 TREX® is the most popular recycled or "plastic-type" deck lumber--by far. TREX® re-cycles Hardwood Sawdust and Plastic Shopping Bags into deck lumber. Click on TREX.com to go to their website for all the details. We recommend TREX® for many reasons. First of all, TREX® is priced about the same, OR LOWER, than competitive products. And most, if not all, of the other companies (that make "alternative" or "plastic-type" deck lumber) are small, regional outfits that may or may not be around to honor guarantees. And most competitors can't show you a successful project that's been around for many, many years. TREX® has been around for more than a decade and can point to several successful, long term, high profile projects around the USA. To our knowledge TREX® has always stood by their product, replacing defective material at no cost and has always put the customer first. TREX® is also the only public company (to our knowledge) devoted solely to "plastic-type" or "alternative" deck lumber. Want to know if TREX® is financially stable? Look up the they're financials--the stock symbol is TWP. And TREX® (again, to our knowledge) is the only Company with Nationwide (& Canadian) distribution. We think, as do most others, that TREX® is really neat stuff--expensive though. The cost of Mister Boardwalk® products is about doubled when we use TREX® (shipping is also more expensive because TREX® is heavier than other deck lumbers). TREX® first got going (in a serious way) in our area (New Jersey), so we can check on high profile projects nearby that have held up well for over a decade, even at the Oceanfront, and still look nearly new. For PUBLIC WORKS & COMMERCIAL PROJECTS, we stongly recommend TREX®. Particularly at the Beach where splinters are a huge liability. One First Aid worker at the beach reported that 10 to 15 splinter cases a day was not uncommon during the busy summer months. Since installing Mister Boardwalk® with TREX®, splinter complaints have been completely eliminated! 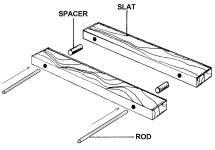 TREX® is not as structural as other deck lumbers, so TREX® must be supported properly. When used in Mister Boardwalk® (directly on the ground), the entire surface must be supported or TREX® can, over time, contour to any low spots, and, under severe load situations (such as a car driving on it), even break at the point where there is no support. We've heard that grease (normally from the barbecue) can be very difficult to remove, but one customer reported that grease is easily removed with OXY-CLEAN. We've also heard that TREX® can be very hot in the summer and freeze quickly in the winter. We have seen neither of these with Mister Boardwalk® since our product lays directly on the ground--the ground temperature cools the walkway in the summer and warms it in the winter. We have used the term TEAK so that the general public will better understand the nature of the material we are offering. We actually supply a product called IPE, a responsibly harvested (no damage to the Rain Forest!) South American Hardwood that we believe is superior to both Teak & Mahogany (& Pressure Treated Pine, for that matter). IPE will probably out last Teak & Pressure Treated Pine and will surely out last Mahogany (It actually rivals "old growth" cypress & cedar heartwood for longevity!). Yet it retains the best qualities of a fine wood. 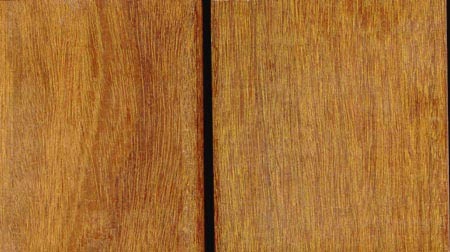 First, it's natural with a beautiful grain that is tight & elegant and the color is rich & warm, virtually the same as Teak. And it weathers to an attractive silvery gray, if you like. Also, IPE is the strongest of the materials we offer, greatly exceeding the strength of the other materials by as much as 100%--it's very tough stuff! For more detailed information, search "IPE DECKING" online.